The Lincoln Stars will open the 2011 USHL Clark Cup Playoffs on the road this Friday night when they will face off against the hometown Fargo Force in Game 1 of their best-of-three series. The puck will drop at 7:35pm on Friday night, and at 7:05pm on Saturday night. If there is a need to play a game three, that game will occur on Sunday evening at 5:05pm. Click here to listen to Stars radio announcer Mike Melbye call the games on AM 1480 KLMS. You can also watch the games via B2 Network by clicking here. If you want to follow the Pointstreak boxscores, click here. The Stars and Force finished the regular season with the exact same records, 33-22-5 (71 points), but since Fargo won the regular season series against Lincoln, going 5-2-1, the Force therefore earned the right to host every first round playoff series at home. This new playoff setup isn't making a lot a friends with hockey fans in Lincoln as a result. For there to be more hockey at the IceBox this season, the Stars will have to win two games in Fargo this weekend. Like I stated above, the Stars did not fare so well against the Force in the regular season. 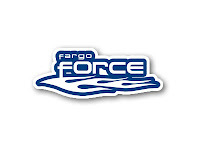 In fact, the Stars had a winning regular season record against every western conference team except the Fargo Force. The Stars finished 0-1-1 against the Dubuque Fighting Saints, but I refuse to recognize the Saints as a true western conference opponent. In four regular season games at the Scheels Arena in Fargo, the Stars finished with a 1-3-0 record, the only win being a 3-0 shutout by Kevin Murdock on 3/11/11. Strangely enough, the Force are the only western conference playoff team with a losing home record in the regular season (14-12-4). In those four games in Fargo in which the Force went 3-1-0 against Lincoln, they out-scored the Stars 19-12. On offense, the Force are led by a couple of very good forwards in Jimmy Mullin (23g, 37a) and Chad Demers (18g, 32a). Although they are not as deep offensively as the Stars, the Force still have a number of forwards who can put the biscuit in the basket. While the Force have four players who scored 30+ points in the regular season, the Stars had seven players who scored 30+ points. The two big names on the Stars' roster in terms of point scorers is Ryan Dzingel (23g, 44a) and John McCarron (24g, 33a). However, the Stars have shown all season that they do not rely on one or two lines to score goals. Lincoln sports a very deep bench, and all four offensive lines are capable of scoring. On defense, both Lincoln and Fargo both have a very good offensive defenseman who quarterbacks their powerplay. Brian Cooper of the Force is a young ('93) d-man who has already committed to the University of Nebraska-Omaha. Cooper racked up 33 regular season points (11g, 12a), and 15 of those 33 points came on the powerplay. For the Stars, defenseman Matt Prapavessis has been a rock on the Lincoln blueline, scoring 34 points (10g, 24a) in only 48 games played. 16 of the 34 points Prapavessis accumulated in the regular season came on the powerplay. In net, the Stars are led by Kevin Murdock, whose 29 regular season wins was second best in the entire USHL. In my opinion, Murdock was the regular season MVP for the Stars. Doc single-handedly won games this season that the Stars otherwise should have lost. In 8 regular season games against the Force, Doc finished with a 3-3-1 record, a 2.85 goals against average, and a .906 save percentage. The Force are led by the two-head monster of goaltenders Ryan Massa and Zane Gothberg. Massa played in 33 regular season games, while Gothberg played in 23 regular season games. From what I have read online, it appears that Force head coach Jason Herter will go with Massa as the #1 goaltender in the first round. Massa, who is also a University of Nebraska-Omaha recruit, went 3-2-0 with a 2.63 goals against average, and a .882 save percentage in five regular season games against the Stars. Despite the losing record in Fargo this season, I think the Stars have a very good chance at beating the Force this weekend. Without a doubt, game one will be key. If the Stars can come out strong Friday night and get a win, they will be in the drivers seat. Coming into the playoffs, the Stars were one of the hottest teams in the USHL, winning 8 of their last 10 regular season games. The Force, however, were a bit stagnant going 5-5-1 in their last 11 regular season games. We've seen the Stars handily beat the best of the USHL this season, so winning this series in Fargo certainly can be done. I think the key in this series will be which team wins the special teams war. The Stars have had one of the top PP units in the USHL this season, but they have struggled with the man-advantage as of late, going 0-14 in the last four regular season games. This should be one heck of a physical series. The last time these two teams met in the post-season, it was 2009, and the Force swept the Stars 3-0 in their best-of-five series. Stars head coach Chad Johnson stated this past week at the Lincoln Stars Blueline Booster Club meeting that forward Garrett Peterson would likely not play this weekend. Petey injured his hand last weekend when he blocked a shot against the Tri-City Storm. Coach Johnson also stated that Brent Tate would miss the Friday game against Fargo, but should be available for the Saturday night game. Speaking of Stars head coach Chad Johnson, click here to read an article from Ryan S. Clark about Johnson returning to coach against the team he used to be an assistant for. Whew! I don't know about you guys, but I'm ready for playoff hockey! It's a shame we won't see any in Lincoln for the first round, so we'll have to plan for it in the second round! We will be doing a live in-game chat for all of the playoff games, so make sure you check us out. I'll have the chat up and running around 7:15pm on Friday night. If you can't be in Fargo, join us here on the B³! Hope to see you all there.